Updated pic from 12/6 - better light! I had a few wood panels sitting around the studio and I decided to bust out the oil pastels and do a little landscape painting. These are really fun for me. I love blending and layering colors with the oil pastels. I may try a few more of these soon. First, I laid a coat of gesso down and then did an undercoat of red-orange acrylic paint. I then used Sennelier oil pastels to finish it out. It's like painting with lipstick. 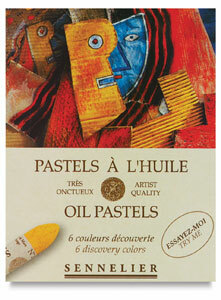 They are the best oil pastels I've found! The picture above doesn't quite do the colors justice....I need to figure out some better ways to photograph these. I really didn't make a point to photograph it perfectly but any photo suggestions or tips would be greatly appreciated!! Thanks Jennifer! I'm going to retake a photo of this piece. This photo really doesn't capture the true colors. I'll repost.